Join National Geographic photographer Martin Edström on this unique and demanding expedition to a place where only a few people before you have left their footprint. 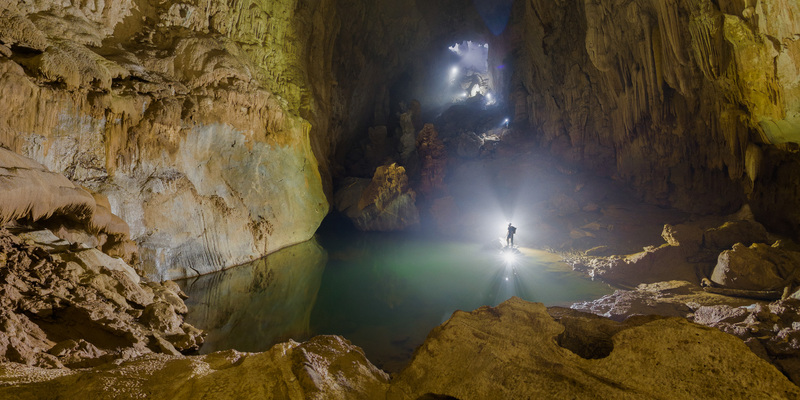 Take the chance to be one of the first people on earth to explore, camp inside and photograph Son Doong – the world’s largest cave and its surrounding cave system. Slowly we descend down the 90-meter rock wall and when our feet meet the uneven ground below, we feel as we have set foot on another planet. We are met with a stunning landscape with vast cave halls and enormous stalagmite formations that will set off your imagination and photographic creativity to capture this underground world. The expedition is led by National Geographic photographer, Martin Edström, who first made the cave famous for the outside world with a unique and interactive, virtual 360° story for Nat Geo. You now have the opportunity to come along Martin and Zoom Photo Expeditions on this incredible expedition where you will camp inside the cave system for several days while photographing its large chambers, subterranean lakes and lush jungles under the light of giant sinkholes. Experience and photograph the world’s largest cave, Son Doong. Admire the world’s largest stalagmite, Hand of Dog. Camp inside the cave for several nights and swim in underground rivers. Explore huge sink holes with lush cave jungles. Photograph the world’s third largest cave, Hang En. Experience the wild with challenging hiking, trekking and climbing. We bring top of the line powerful LED-lighting and generators for shooting in the dark. Cave photography and 360° photo workshops inside the cave. Personal tutoring with Martin Edström throughout the trip. Martin Edström grew up in Sollentuna, north of Stockholm and fell in love with photography as a 12 year old. He inherited his first analogue camera from his grandfather and with it, he developed his passion for photojournalism. Later on for for several years he worked as a reportage photographer for Swedish and international media, in all corners of the world. Today, Martin focuses exclusively on major projects, often for National Geographic, where both technical innovation and visual development plays an important role within his award winning creations. 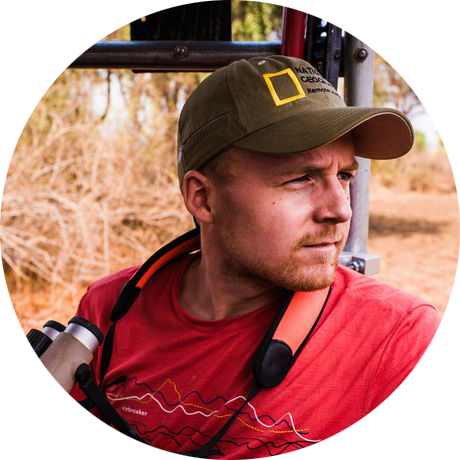 As a National Geographic photographer and journalist, Martin works in the front line for interactive stories and new innovative ways to create photographic experiences. Thanks to Martin’s knowledge and technical solutions, he has been able to bring the audience into 360 virtual tours of everything from the refugee crisis in the Middle East to the magical cave of Son Doong in Vietnam. In 2016, Martin and his team created the first 360-degree movie ever captured of a pride of wild lions in Zambia, opening the door to a whole new way of capturing wildlife. By giving people the opportunity to explore a story, a problem or another one’s perspective (even a lion) in 360-degree virtual reality, Martin makes it possible experience the story in a whole new way – as if you really were there. Admire the world’s largest stalagmite, Hand of the Dog. 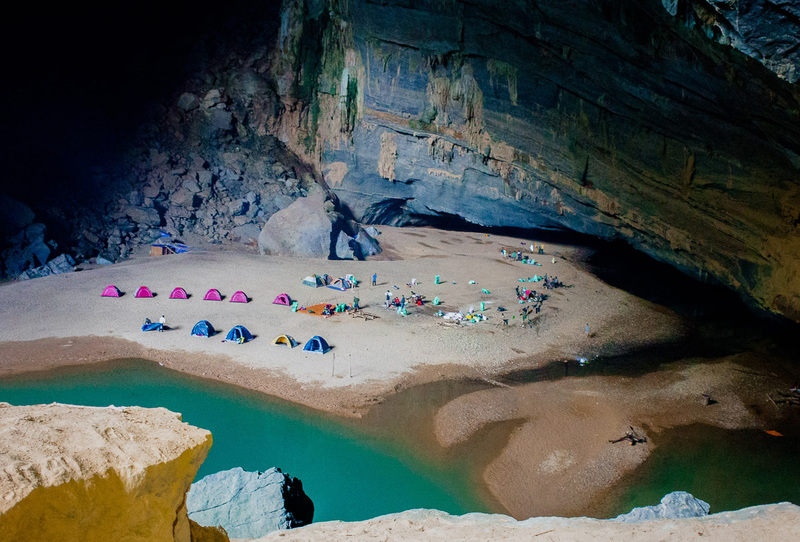 Camp inside the caves for several nights and take a swim in underground rivers. Hanoi is Vietnam’s capital city and the country’s second largest after Ho Chi Mihn with approximately 7.7 million inhabitants. The city is located in northern Vietnam, along the Red River. Hanoi is famous for its beautiful and thriving old town. Originally, each craft and profession had its own street where only that certain type of goods was sold, in some respects this tradition is still carried out. In recent years Hanoi has undergone a rapid and significant change. Skyscrapers pop up and the old town now has a modern skyline backdrop. The third largest cave in the world and a UNESCO world heritage site. Although Hang En was known to the inhabitants of the nearby villages that since long has sought out protection from storms in the caves, it was not until 1994 that a group of British scientists discovered what is probably the world’s third largest cave. There are three known entrances, the largest of which is over 120 meters high, that leads into the cave. For three million years it has been shaped and carved out by the powerful Rao Thuong River that cuts through these mountains. The cave has got its name after the many swift birds nesting on the cave walls. Cave of the mountain river. After being discovered for the first time by Ho Kahn, a local, in the early 1990’s. It took 18years and many failed attempts, until Ho Kahn found it again. 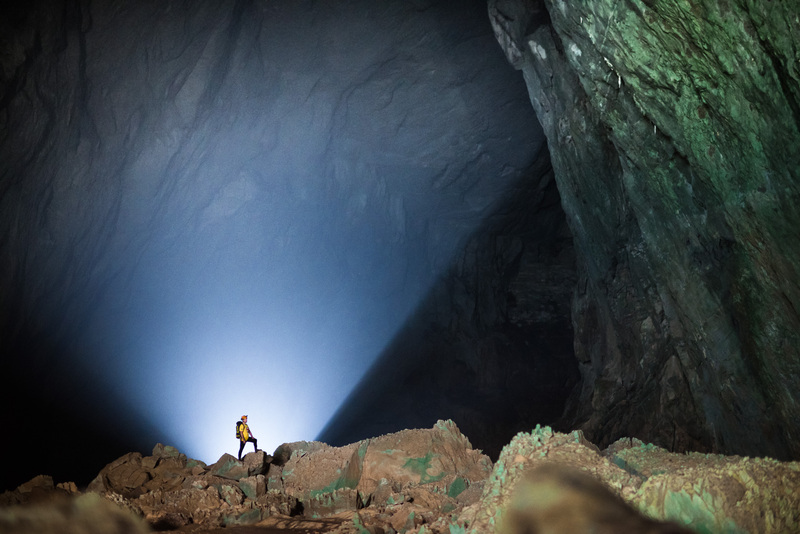 A year later in 2009, he led a group of British cave explorers from the British Cave Research Association on the first exploration of Son Doong, which proved to be the world’s largest cave. Like the Hang En cave, Son Doong has been formed by the Rao Thuong River that has carved through the limestone during millions of years. With a length of 5km and heights of over 200 meters, some areas are large enough to easily accommodate a Boeing aircraft. The size of the cave causes the landscape to vary from barren areas to large passages filled with magnificent stalagmites or large openings filled with lush vegetation and tall trees. This expedition will at some points be very physically demanding and it is a requirement that you can carry out the activities below and thus meet our physical requirements for participation on this expedition. 25 km of jungle and mountain trekking. Height difference of up to 400 meters. 40 river crossings, 10-15 meters wide, in knee-high moving water. 7 km of cave exploration with uneven and rocky terrain, including a 90 meter climb up the “Great Wall of Vietnam”. Underground river crossing with strong currents. Previous experience of multi-day trekking. Good physics and balance, strong legs to handle the trekking. General good health and physics. It’s a plus if you have some previous climbing experience but not mandatory. Oxalis Adventure Tours is the organizer of this expedition. 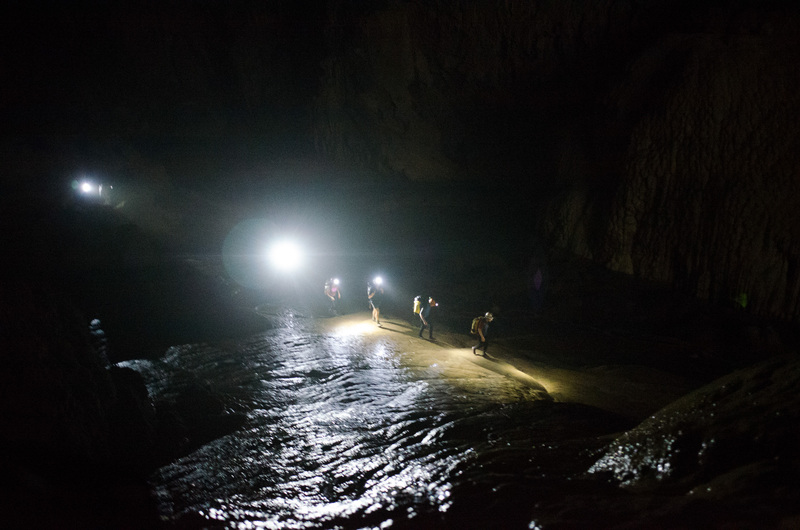 Oxalis Adventure holds the International Tour Operator’s Certificate issued by the National Tourism Bureau of Vietnam, and is made up of a professional team of experts on cave research, safety, tourism and sustainable development. Their guides and cave experts have the right to refuse any participant to continue the expedition if they cannot live up to the physical demands due to security and liability aspects. No compensation will be paid to those who are denied further participation. In the morning we arrive in Hanoi, where we are meet by Martin Edström and a travel host from Zoom Photo Expeditions. In the afternoon we will go on a photo-oriented city tour of Hanoi, where we will have several stops to photograph and experience the city’s thriving life and many attractions. In the evening there will be a welcome dinner where we can get to know each other a bit better and discuss the upcoming expedition. We leave Hanoi in the early morning by air to reach the World Heritage Site, Phong Nha. On arrival, the afternoon will be left open for you to have time to time to rest and recover or have a look around the village. During the evening we gather for an orientation and safety briefing in preparation for the next day’s expedition. After the briefing we will have dinner before we retreat to our rooms for a good nights sleep before tomorrow’s adventure into the jungle. In the morning we leave Phong Nha and cross the Tra Ang Bridge overlooking the National Park and the river below. After about an hour journey we reach the hiking trail and our trek begins. For about an hour we walk downward in the dense and partially steep vegetation. In the small village of Ban Doong, we will have lunch by the river and have the opportunity to learn more about the life of the approximately 40 inhabitants of this isolated village. After our stop in Ban Hoong, we continue our journey deep into Phong Nha-Ke Bang National Park and the Vietnamese jungle. 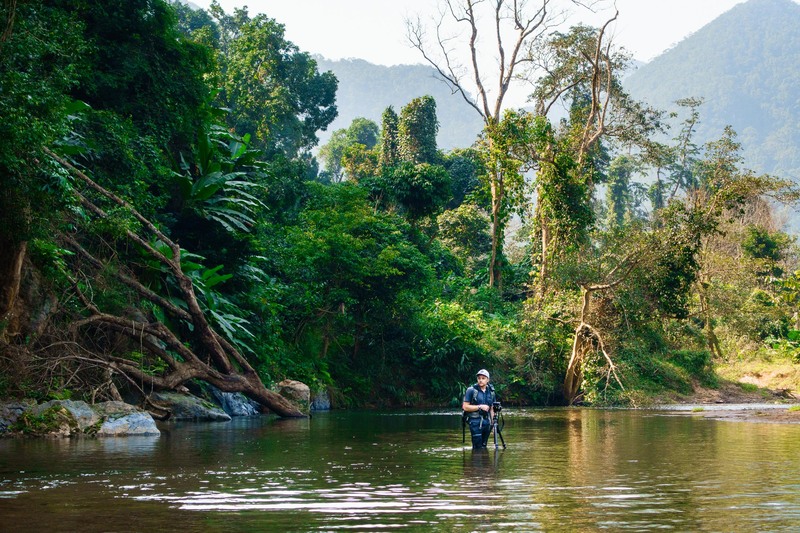 Surrounded by the limestone cliffs that cuts through the vegetation, we trek along the Rao Thuong River, the strong flowing waters have been shaping the spectacular landscape over millions of years. As we cross the river, we are totally surrounded by an indescribably beautiful landscape, birds singing and butterflies swarming. After about a two hour walk along the riverbed, we reach the end of the afternoon’s final destination, the world’s third largest cave, the Hang En cave. We enter the cave to find our spectacular campsite, where we will spend the night. Here you will have a possibility after a long day’s hiking take a cooling dip in the underground river. After dinner, we spend the night and photographing the unique surroundings that Hang En offers. It is a powerful and indescribable feeling to wake up in one of the world’s largest caves. Already in the morning during sunrise, we get some unique photo opportunities when the sun’s rays begin to bask our surroundings with light. After breakfast, we continue to explore and photograph the magnificent cave that was first explored by British cave explorers in 1994. For centuries the cave only known to near by villagers who used the cave as protection during heavy storms. Among other things that can be found in the cave, there are fossils over 300 million years old, to be photographed. In Hang En´s enormous cave hall, we start our cave photography and practice before the next day’s visit of the world’s largest cave. Back in camp, dinner will be served during the evening and we´ll discuss our experiences of the day. After spending another night in the cave of Hang En we prepare with a hardy breakfast for the most challenging day to come, as we traverse rivers and climb up steep cliffs to the world’s largest cave of Son Doong. We leave our camp and trek through Hang’s dark passages to the river, which we will wade through for about an hour. Soaking wet after walking through the knee-high water we perform a steep climb of about 45 minutes, up to the top of the mountain where a well-deserved lunch awaits. After lunch, there will be a safety briefing before it’s time to start repel into the world’s largest cave. With the help of our professional guides, we begin a descent of about 90 meters towards the cave’s opening. As we descend into Son Doong, we are met with an amazing cave landscape with huge chambers and stalagmite formations that triggers the imagination and photographic creativity. We cross the river of knee-high water that has flowed through the cave for a millennium and shaped the cave’s surroundings. It is a powerful and magical feeling to be in the world’s largest cave. When we reach a passage with deep gorges and uneven terrain, we’ve arrived at the impressive “Hand of Dog” and are rewarded with amazing photo opportunities. The “Hand of Dog” rock formation stands impressive against the ceilings roof, and with a height of over 70 meters it is probably one of the world’s highest stalagmites. From the top of the rock formation we have a magnificent view of the huge passage. Illuminated with help of artificial light, we will be given an incredible photo opportunity. At a slow pace we trek down the “Hand of Dog” and towards the campsite of the night. After short break in camp we continue to photograph the area’s over 350 million years old coral fossils. This area offers you everything from landscape to macro opportunities. After heading back to camp again we have dinner and discuss our experiences from our first day in the world’s largest cave. We finish the day by photographing night shots of our illuminated tent camp. We wake up in the world’s largest cave and will spend time photographing the area around “Hand of Dog” and its surrounding passage, large enough to accommodate a Boeing airplane. During our trek towards the expedition’s second tent camp we will get lots of photo opportunities. After a trekk of about one and a half hours, with partially steep climbing, we return out in the daylight to find the first sinkhole. This collapsed part of the cave is called “Watch out for Dinosaurs” and it’s easy to understand why, when we stand in the green surroundings with steep cliffs it feels like a setting from a Jurassic Park movie. According to researchers, this sink hole was formed about 500,000 years ago when the cave could no longer bear its own weight and the ceiling caved in. During the day we will be able to photograph the fascinating surroundings and its stalagmites. After a lot of unique photo opportunities, we leave the daylight and once again continue down into the cave to one of the most beautiful areas of Son Dong. Surrounded by fossils, we get the opportunity to photograph in one of the areas of the cave, that is least affected by nature’s elements. The water dripping from the cave roof has formed imaginative formations around us. As we walk further through the cave, we see how the vegetation grows greener and greener, lusher and lusher, and when we once again we ascend in to the sunlight and hear the birds sing, we find ourselves in the green lush surroundings of the cave’s other sink holes. We move through the dense vegetation and when the cave’s roof closes around us, we have arrived at the expedition’s next camp. During the rest of the day, we will photograph the fascinating surroundings. During the day, we spend most of our time around the cave’s sink holes. It is an indescribable feeling to stand it this dense vegetation and look at the surrounding rock walls that enclose this green underground jungle. As we walk among the tall trees, it’s easy to forget that we are in the world’s largest cave. Throughout the years, in the green surroundings of the sinkhole traces of the same rich wildlife as in the jungle above, has also been found. The same birds, monkeys and snakes live in the sinkhole. With our memory cards filled up, we leave the daylight and walk through a steep path back down and return to our tent camp. During the afternoon we leave to wander deeper into the cave, to photograph the stalagmite landscape, with the help of our powerful light equipment. The lack of light has caused the wildlife in this area to adapt, and in the rugged landscape of the cave several new insect species have been discovered. When we once again return home to camp in the evening, a well deserved dinner awaits. After our last night and a proper breakfast in the world’s largest cave, we prepare for our expedition’s final day. 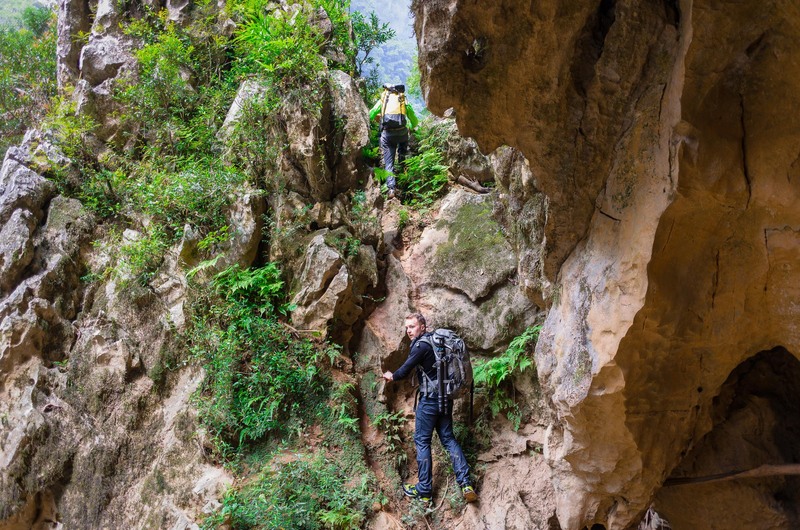 The last trek takes us through the cave to the “Wall of Vietnam”, where we climb up the steep mountain wall, with the help of ropes and ladders. From the top of the 90-meter-high wall, we can see a shimmer of light by the cave exit. Out of the cave and into the jungle, we move over rocky terrain before finally reaching civilisation again. After a shorter transport by car we arrive at Chay lap Farmstay, where a swimming pool and cold beers are waiting for us. During the evening we have a farewell dinner together. With tender and sore bodies and memory cards full of incredible pictures, the end of the expedition is here and we will return to Hanoi for further transportation to our individual destinations. We leave our camp and trek through Hang’s dark passages to the river, which we will wade through for about an hour. Soaking wet after walking through the knee-high water we perform a steep climb of about 45 minutes, up to the top of the mountain where a well-deserved lunch awaits. After lunch, there will be a safety briefing before it’s time to start repel into the world’s largest cave. With the help of our professional guides, we begin a descent of about 90 meters towards the cave’s opening. As we descend into Son Doong, we are met with an amazing cave landscape with huge chambers and stalagmite formations that triggers the imagination and photographic creativity. We cross the river of knee-high water that has flowed through the cave for a millennium and shaped the cave’s surroundings. It is a powerful and magical feeling to be in the world’s largest cave. When we reach a passage with deep gorges and uneven terrain, we’ve arrived at the impressive “Hand of Dog” and are rewarded with amazing photo opportunities. The “Hand of Dog” rock formation stands impressive against the ceilings roof, and with a height of over 70 meters it is probably one of the world’s highest stalagmites. From the top of the rock formation we have a magnificent view of the huge passage. Illuminated with help of artificial light, we will be given an incredible photo opportunity. At a slow pace we trek down the “Hand of Dog” and towards the campsite of the night. After short break in camp we continue to photograph the area’s over 350 million years old coral fossils. This area offers you everything from landscape to macro opportunities. After heading back to camp again we have dinner and discuss our experiences from our first day in the world’s largest cave. We finish the day by photographing night shots of our illuminated tent camp. We wake up in the world’s largest cave and will spend time photographing the area around “Hand of Dog” and its surrounding passage, large enough to accommodate a Boeing airplane. During our trek towards the expedition’s second tent camp we will get lots of photo opportunities. After a trekk of about one and a half hours, with partially steep climbing, we return out in the daylight to find the first sinkhole. This collapsed part of the cave is called “Watch out for Dinosaurs” and it’s easy to understand why, when we stand in the green surroundings with steep cliffs it feels like a setting from a Jurassic Park movie. According to researchers, this sink hole was formed about 500,000 years ago when the cave could no longer bear its own weight and the ceiling caved in. During the day we will be able to photograph the fascinating surroundings and its stalagmites. After a lot of unique photo opportunities, we leave the daylight and once again continue down into the cave to one of the most beautiful areas of Son Dong. Surrounded by fossils, we get the opportunity to photograph in one of the areas of the cave, that is least affected by nature’s elements. The water dripping from the cave roof has formed imaginative formations around us. As we walk further through the cave, we see how the vegetation grows greener and greener, lusher and lusher, and when we once again we ascend in to the sunlight and hear the birds sing, we find ourselves in the green lush surroundings of the cave’s other sink holes. We move through the dense vegetation and when the cave’s roof closes around us, we have arrived at the expedition’s next camp. During the rest of the day, we will photograph the fascinating surroundings. During the expedition we will use several porters. During the days, you will only carry your personal camera equipment. But remember to pack as light and easily as possible. Make sure to pack everything in to waterproof bags as you will get wet. There is a steady climate inside the cave with a temperature of 28 degrees Celsius so you will have no need of warm clothes. Helmet and strong headlight will be provided. Lenses, from 24mm to 200mm are recommended. Fixed prime lenses like 35mm and 50mm works really well in the cave. Macro lens, if it interests you, there are many potential subjects to photograph. Sturdy tripod that fits into your backpack. Flash, if you want and shoot beyond our light equipment. Waterproof bags, in which you can store and protect your equipment. Special wet-shoes are recommended as we sometimes walk in rivers, gore-tex material are not recommended as it drains poorly and will keep you wet. Complete packing list for all the necessary clothing and equipment will be provided in good time before the expedition. The recently opened Boss Legend Hotel offers 80 spacious rooms, each with a TV, air conditioning, safe and mini-bar. For activities, there is both an indoor and outdoor pool in the hotel and in the Spa there is the possibility to work out and enjoy various treatments and massages. Free Wi-Fi is available throughout the hotel. During the days spent in the caves we live in tents two and two. The tent contains sleeping bags, mats, pillows and other necessary equipment. Located just a few miles from the National Park is Chay lap farmstay. The resorts’ 39 rooms are divided into four categories where all rooms have amenities such as air conditioning, TV and wi-fi. 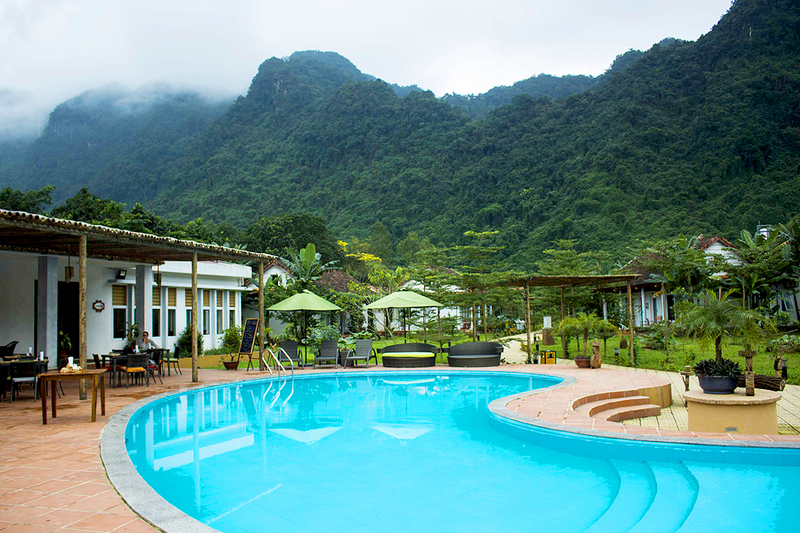 For those who want to relax with a cold beer after the expedition you will find a pool area as well as a bar and restaurant with a menu of traditional Vietnamese dishes. NOTE! All prices are based on 2018 prices. Expedition prices and permits for 2019 are not yet available. As soon as these are available, exact prices and dates will be presented. All transport in the program. Accommodation in a double room according to program. Accommodation in a tent-camp while in the caves. All activities according to programs. Cave and climbing equipment, helmet, strong headlamp is provided. Special extra bright LED lighting for cave shooting. Local guides and expedition teams. Participation by Martin Edström during the expedition. Travel documents and travel information before the trip. Personal expenses such as drinks, phone calls, etc. Tip for local guide, 10 USD / day. Transport to Vietnam. If you wish, we are happy to help you with your flight booking. Target participants: Adventure and outdoor photographers over 18 yrs. In order to get the most out of the trip, we recommend the previous photo knowledge. Other: For more information about Zoom Photo Tours and our terms and conditions, click here. The airfare to Vietnam is not included in the price. But if you wish, we are more than happy to help you arrange all your flights. Just send an email to info@zoomphototours.com and we will respond with flight suggestions and prices. All meals according to program. All activities according to program. The international airfare to Vietnam is not included in the price. But if you wish, we are more than happy to help you arrange all your flights. Just send an email to info@zoomphototours.com and we will respond with flight suggestions and prices.